EMI -- having previously floated the idea of releasing its music as DRM-free MP3s -- has dropped the other shoe: it won't consider the move unless it gets some money. Lots and lots of money. So much that no one will say how much. 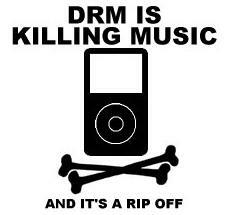 Which is funny, since removing DRM can only help sell music. After all, no one buys music for the DRM. People who buy DRM songs -- instead of nicking the same music on P2P -- do so because they don't mind the DRM, or because they don't know about the DRM, or because they are willing to hold their nose. Presumably, there are people who are aren't willing to hold their noses (I'm one of them) who'd buy if the DRM was gone. Online music giants Apple and Microsoft, along with smaller players including RealNetworks and Yahoo! Music, sought to indulge EMI's demands by waving leafy-green dollar bills at the company, but it wasn't what EMI asked for, and the company subsequently put the talks on hold. Warner's renewed interest in EMI is likely another contributing factor to EMI's own cold feet: Warner's leadership is devoted to DRM, making the DRM-free discussions all the more circumspect. While it has become a truism in tech enthusiast circles that 'no DRM equals more sales,' EMI and other record companies are pleased enough with the status quo that they expect any "risk" to be shouldered by retailers. If a "non-DRM tax" of sorts were applied to music, online retailers would have no choice but to increase the cost of downloadable music.